Step 1. Create a new DataSet and select the EOD Scaling Provider. Step 4. Name the new DataSet. The Wizard will suggest to use the same name as the "parent" DataSet, but also adds the parameters selected. Conflates n Daily bars into one. Warning! 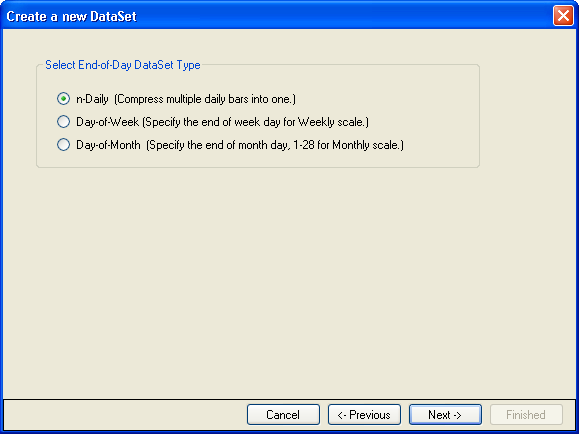 This provider does not align the resulting bars so that the nth bar will consistently fall on the same calendar day. Consequently, depending on how you load the data, or if there are missing bars, the final set of bars can change. For consistent results, use the Data Range option to load data, specifying the Starting Date. Returns weekly bars ending on the specified day of the week. For example, if you select Monday, the weekly bars will consist of an opening price on the first trading day after Monday and closing on the next Monday. If Monday is a holiday, then that week's bar will end on the previous trading day. Returns monthly bars ending on the specified day of the month. For example, if you select "15", the monthly bars will consist of an opening price on the first trading day after the 15th of the month and closing on the 15th of the next month. If the 15th is a holiday, then that month's bar will end on the previous trading day. The provider will always return the last bar, complete or incomplete. 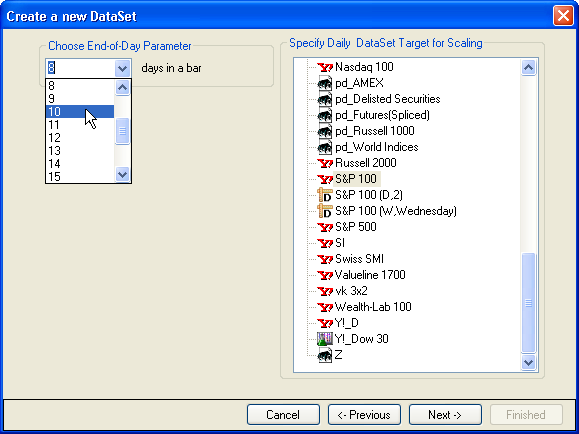 For example, if you're scaling Day-of-Week bars on Wednesday, and the date is 9/30/2011 (a Friday), the final bar will end on 9/30/2011 with only Thursday's and Friday's data. You should know that if you're trading a Strategy with this DataSet that you should only pay attention to the Alerts after Wednesday's update. For the new scaled DataSet to work properly, you must use Wealth-Lab's native "Daily" scaling, even for Day-of-Week Weekly or Day-of-Month Monthly Bars. Selecting "W" or "M" chart scaling will produce undesired results. The EOD Scaling Provider does not store data. When the "parent" DataSource is updated, this provider's accesses that data.